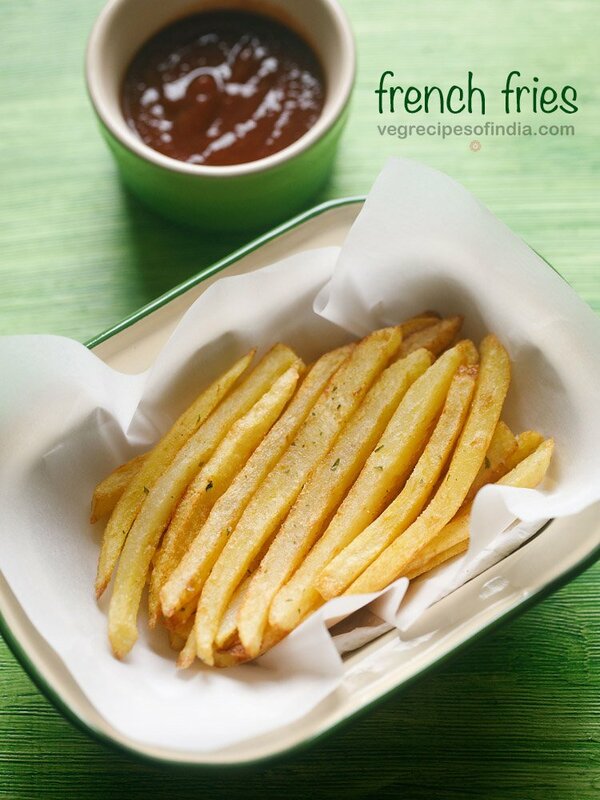 french chips recipe - crispy french fries or finger chips that can be made at home easily. french fries recipe with step by step photos – we love french fries. who doesn’t!!! let me tell you that these french fries come very close to the ones we get in mc donalds or any other fast food chains. 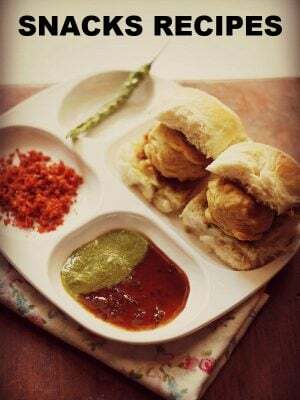 they are crisp as well as soft from inside and taste too good. i had got a couple of recipe requests for posting french fries. when i make french fries at home, i just chop the potatoes, rub some salt and directly fry them. 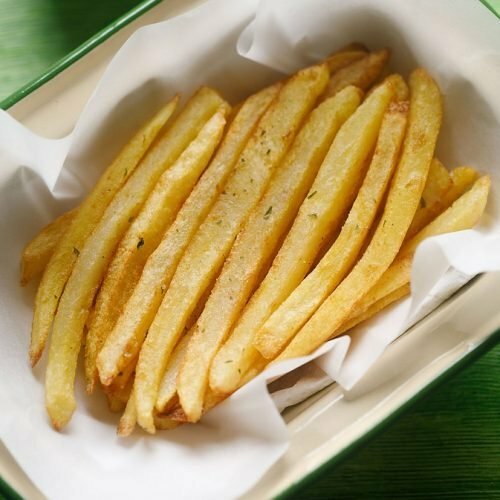 the potatoes are not perfectly crisp like the mc donald’s french fries – but for all of us, these homemade easy to prepare quick french fries are alright. when i got the requests, i searched a lot of recipes on the web for that perfect french fries. i stumbled upon many and they all tell me to parboil the potatoes first, then fry it not once, but twice at different temperatures. now being a busy woman, i cannot afford to spend a major chunk of my time cooking the potatoes, then cooling them, then frying them, cooling them and again frying them. so i gave up the quest for the perfect french fries and even if some recipe comes close to it, i will be more than happy & satisfied. 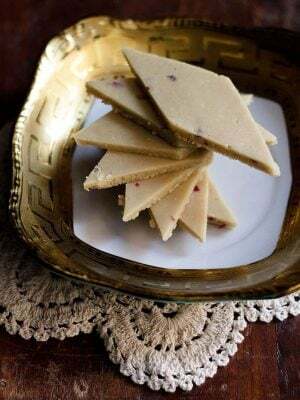 this is my friend anamika’s recipe. she has kept it simple and easy. in this method, the potatoes are kept in cold water for 30 minutes. i actually kept the whole bowl of chopped potatoes with cold water in the fridge. then drained & dried the potatoes with a napkin and later fried twice. 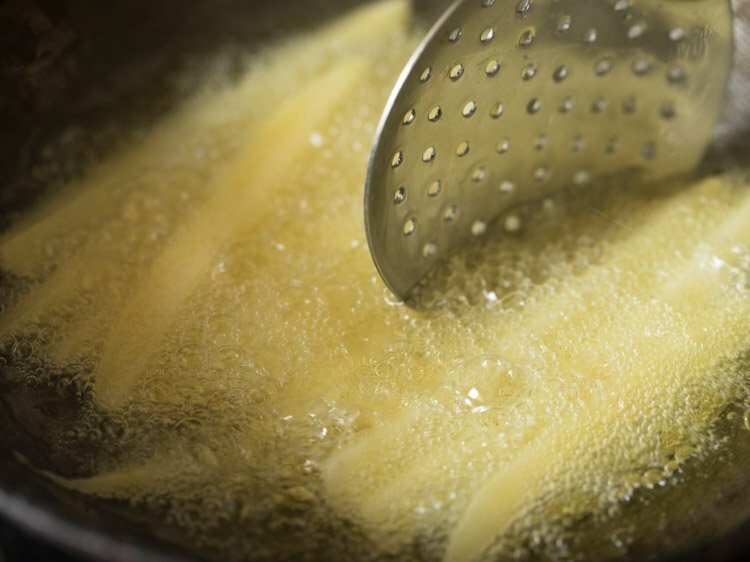 yes to get that perfect crispy french fries, you need to fry them twice. you can fry the potatoes once if you want, but they will be less crispy. as a result of being fried twice, these french fries are crisp from outside and soft & tender from inside. the way the french fries should be. 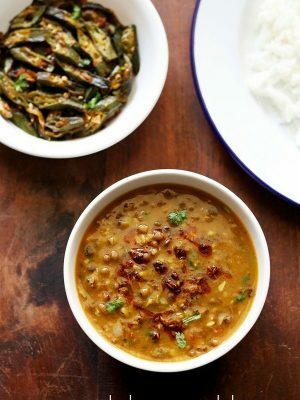 this finger chips recipe can also be a navratri fasting recipe if you use rock salt (sendha namak). firstly take the potatoes and rinse well in water. then peel them. 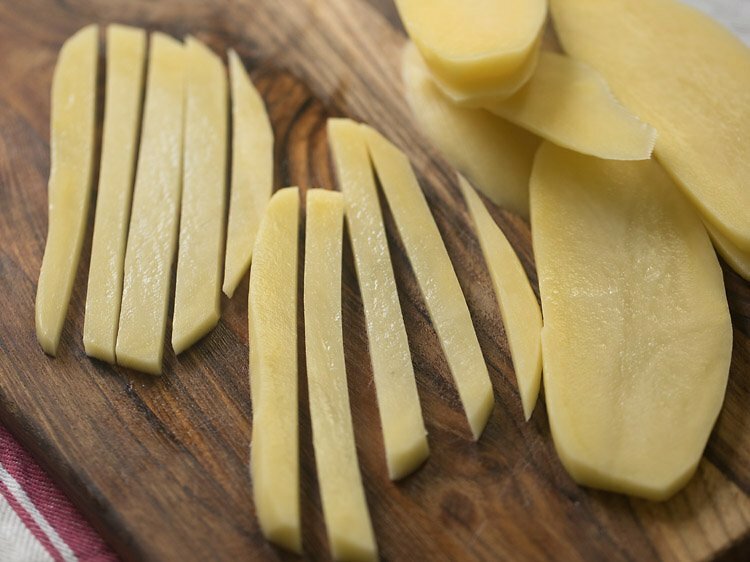 then slice the potato in slices having 1 cm thickness. 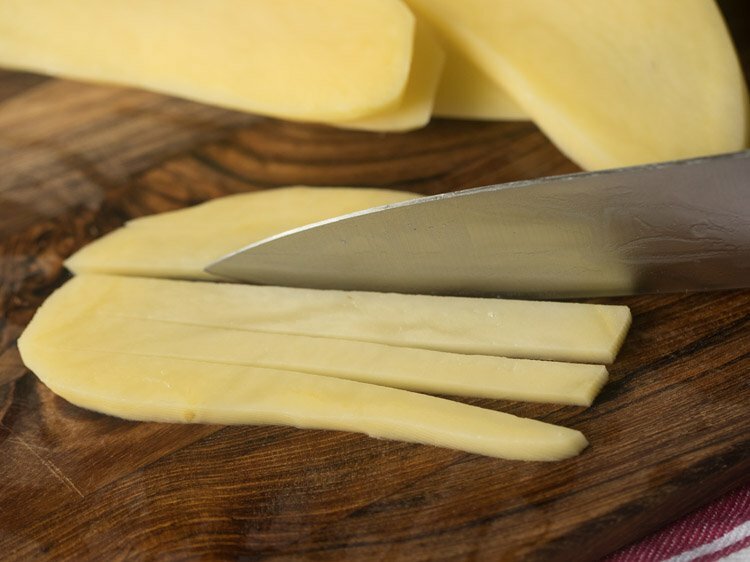 before slicing, you can remove the top and bottom part of the potato to get a square or rectangle shaped potato. then begin to cut them in sticks having 1 cm width. 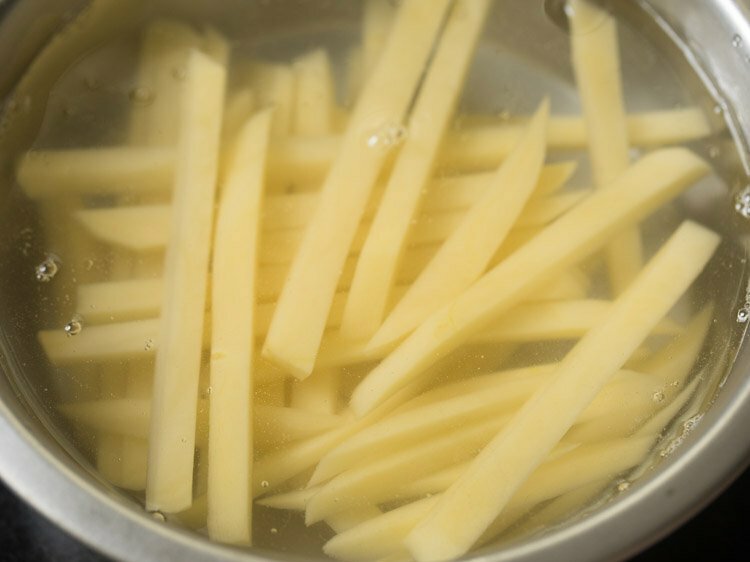 you can also rinse these potato sticks for a couple of times in water to get rid of the starch. in a bowl take 3.5 cups cold water and dunk the potatoes in it. 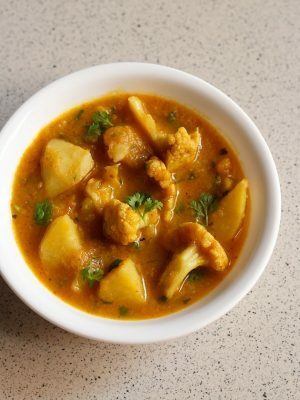 keep this bowl outside or in the refrigerator for 30 minutes to 45 minutes. in a hot and humid climate keep the bowl in the fridge. after 30 minutes or 45 minutes, drain the potatoes in a colander. rinse the potatoes with running water. drain all the water. then place them on clean kitchen cotton napkin. place the second half of the napkin above and press, pat and dry the potatoes. the potatoes have to be completely dried before you begin to fry them. heat oil in a wok or pan. keep the flame to medium. the oil should be medium hot or having a temperature of 130 to 135 degrees celsius. now add the potatoes in the oil. you can fry in two to three batches. i fried in two batches. do not over crowd the wok (kadai) or pan. stir often while frying them for uniform cooking. fry till the potatoes get cooked, but they should not brown from outside. they should just get a crust from outside without any major color change. light browning of the edges is fine. remove with a slotted spoon. place the half fried potatoes on paper kitchen towels. stack 3 to 4 paper towels. press some paper towels from top also to absorb extra oil. let the half fried potatoes cool down at room temperature. after removing this batch, you can fry the second batch of potatoes. by the time you fry the second batch of the potatoes, the first batch will cool down. so in the same oil, you can fry the first batch of half fried potatoes. now increase the flame to a medium-high or high. the oil should be hot and have a temperature of 180 to 185 degrees celsius. add the half fried potatoes to the hot oil. stirring often begin to fry the potatoes. 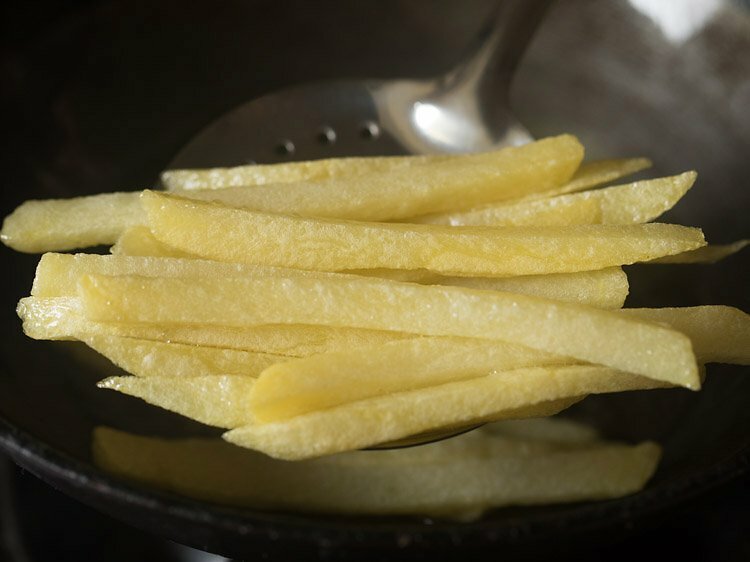 fry french fries till crisp and golden. remove with a slotted spoon. place french fries on paper tissues again to remove the extra oil. 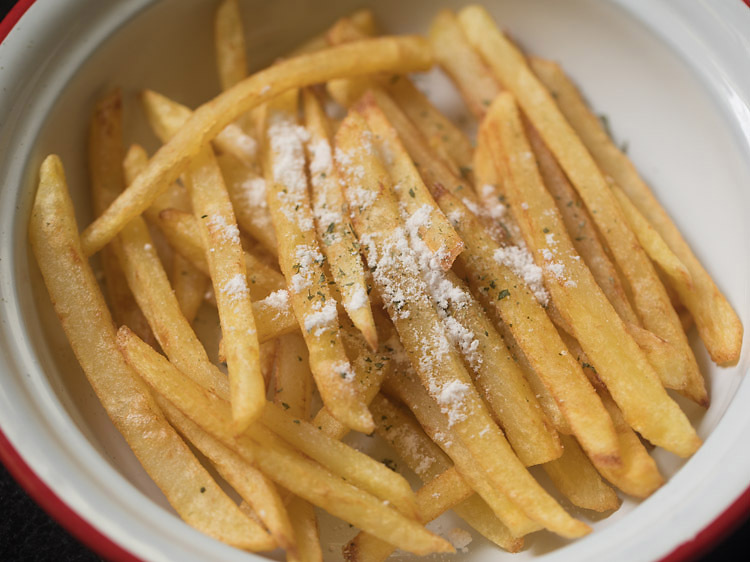 while still hot, take the french fries in a bowl. sprinkle with some salt, paprika or red chili flakes, dried herbs or dry rosemary. you can add your choice of herbs and spices. gently shake and toss the bowl so that the salt, herbs etc mix well with the french fries. 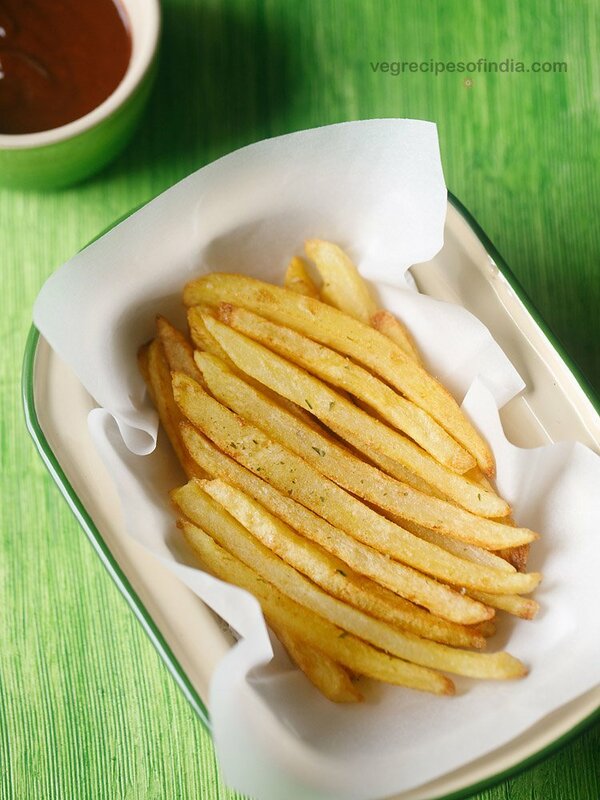 serve french fries hot with some any dip or sauce of your choice. 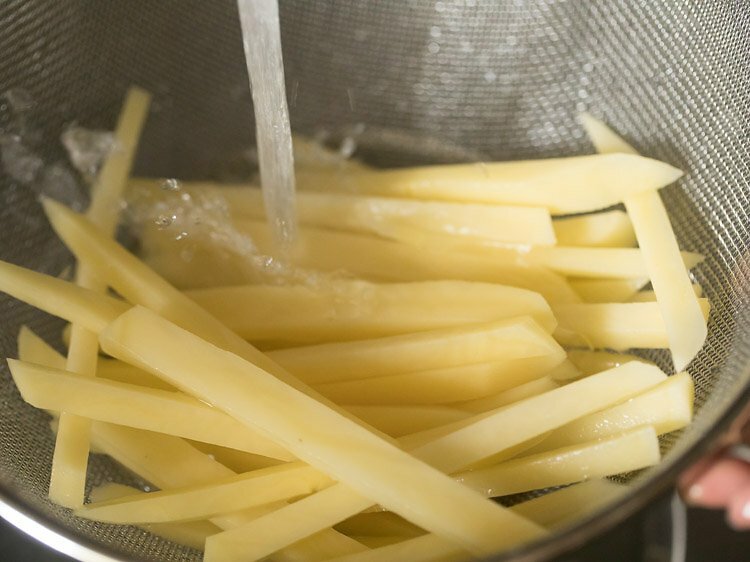 soaking the potatoes in cold water help them to get crisp nicely and they get evenly fried. 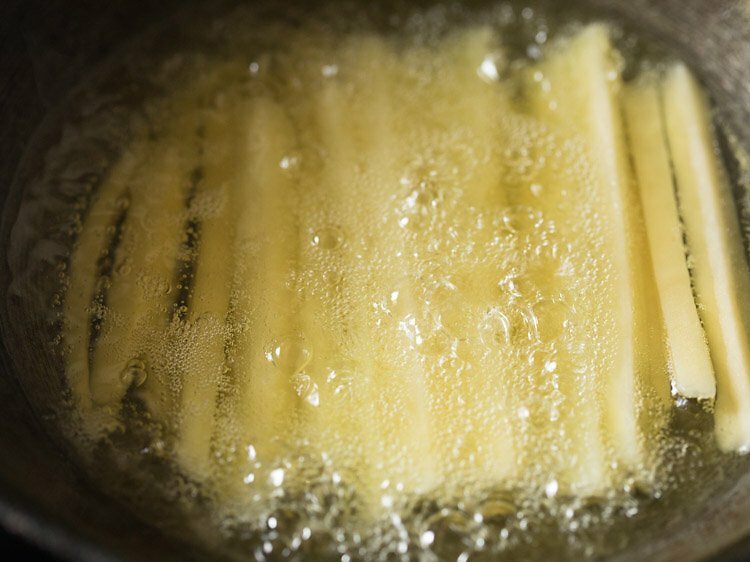 rinsing the potatoes in water or cold water helps to remove starch, which can cause the potatoes to stick together during the frying process. 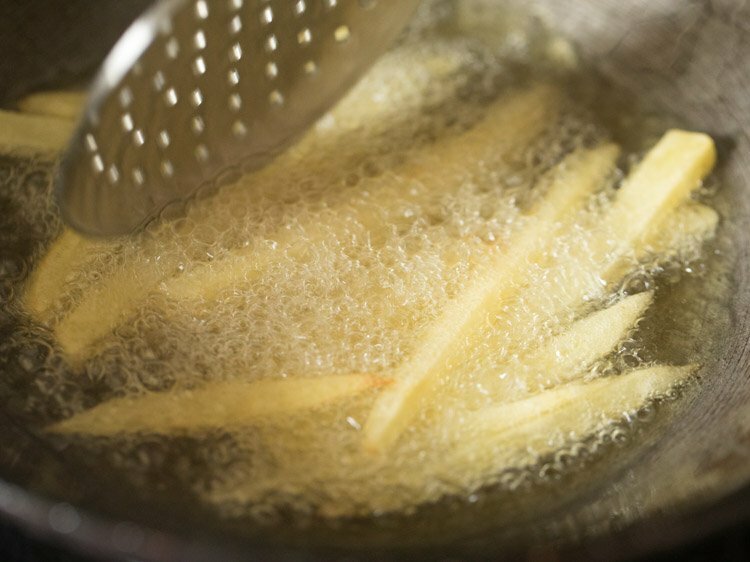 alternatively, for crispier french fries you can also soak the potatoes in salt water for several minutes before frying. 1. firstly take 1 extra large potato or 2 large potatoes or 3 medium potatoes (315 grams). rinse well in water and then peel the potato. 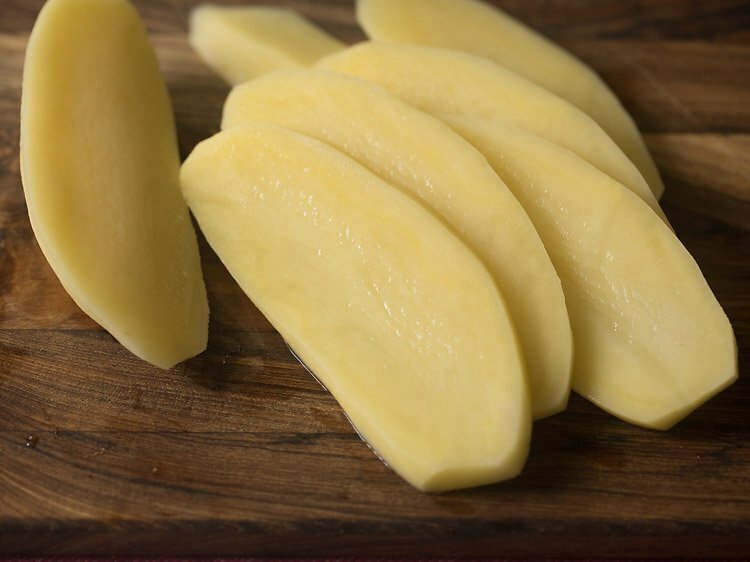 2. then slice the potato in slices having 1 cm thickness. 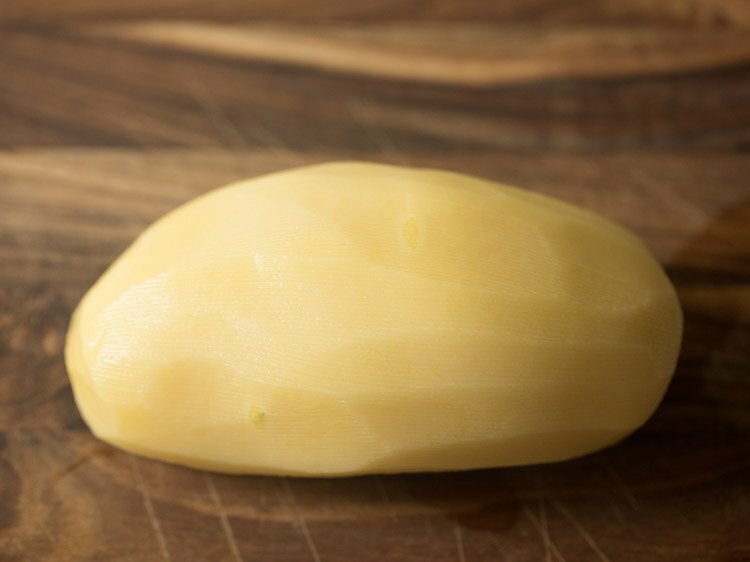 before slicing, you can remove the top and bottom part of the potato to get a square or rectangle shaped potato. 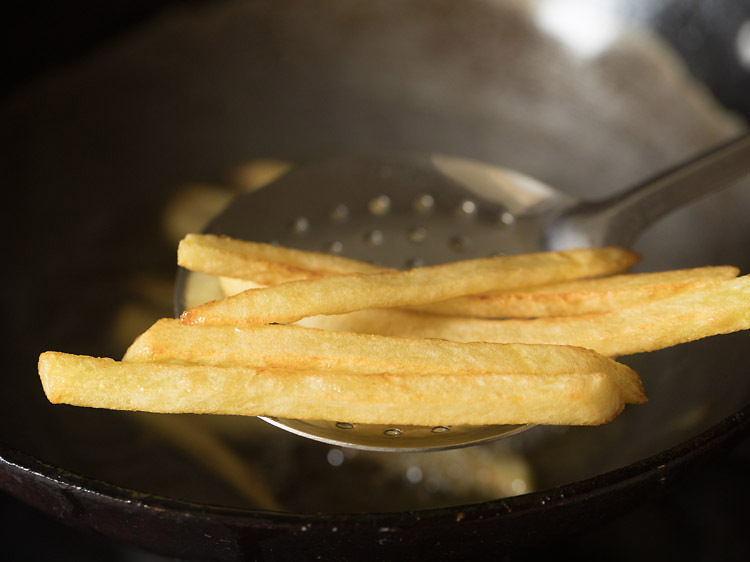 you can also use a french fry cutter if you have it. 3. then begin to cut them in sticks having 1 cm width. 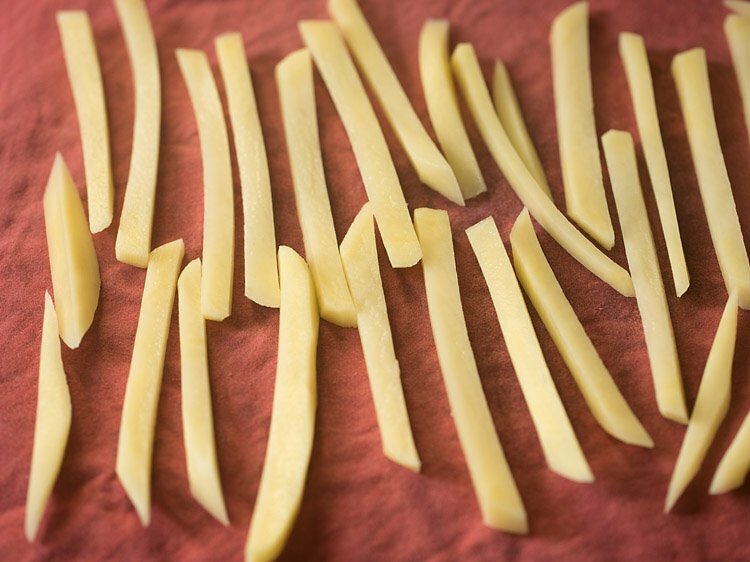 4. cut the remaining potato slices in sticks as well. 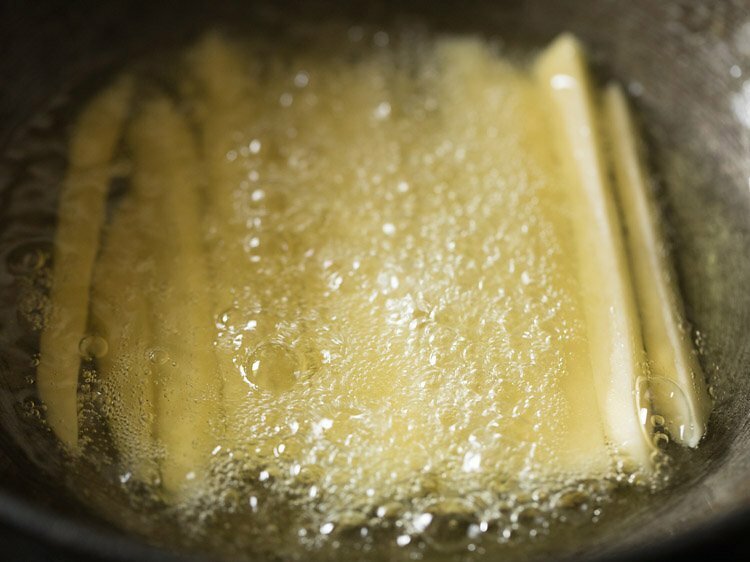 5. you can also rinse these potato sticks for a couple of times in water to get rid of the starch. in a bowl take 3.5 cups cold water and dunk the potato sticks in it. keep this bowl outside or in the refrigerator for 30 minutes to 45 minutes. in a hot and humid climate, keep the bowl in the fridge. 6. after 30 minutes or 45 minutes, drain the potatoes in a colander. 7. rinse the potatoes with running water. drain all the extra water. 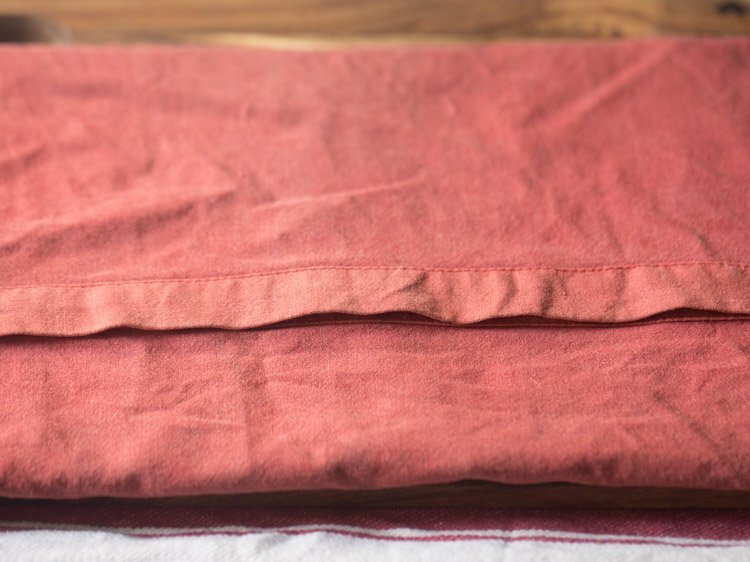 8. then place them on a clean kitchen cotton napkin. 9. place the second half of the napkin above and press, pat and dry the potatoes. the potatoes have to be completely dried before you begin to fry them. 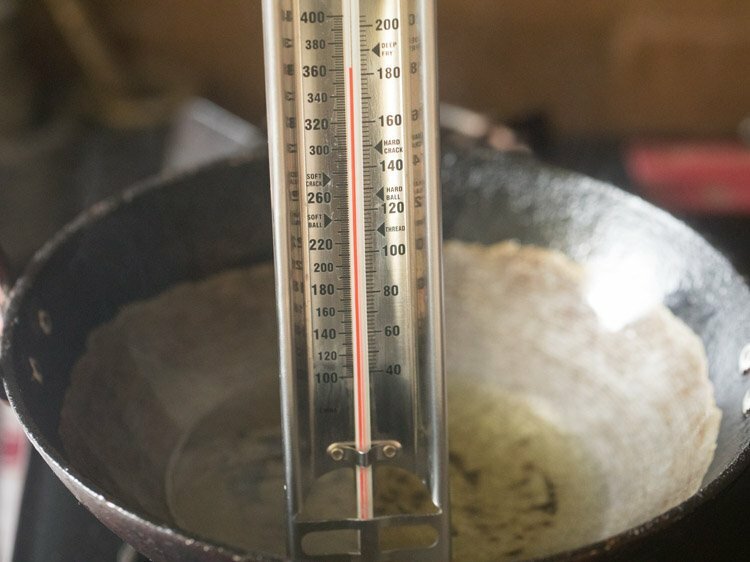 10. heat oil in a wok or pan. keep the flame to medium. 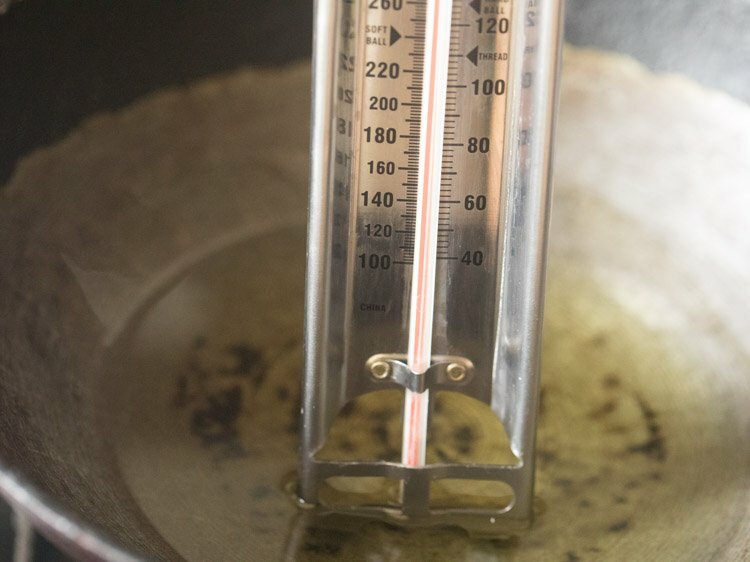 the oil should be medium hot or having a temperature of 130 to 135 degrees celsius. 11. now add the potatoes in the oil. you can fry in two to three batches. i fried in two batches. 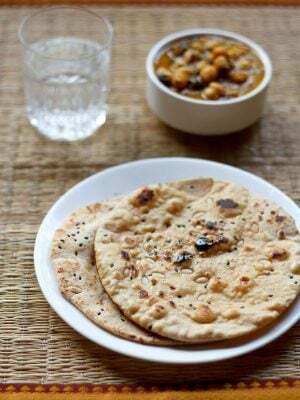 do not over crowd the wok (kadai) or pan. 12. begin to fry them. 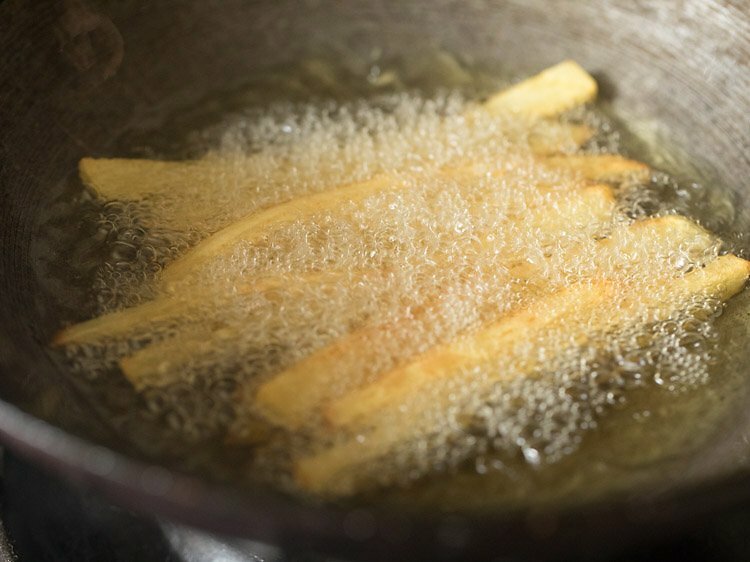 13. stir often while frying them for uniform cooking. 14. fry till the potatoes get cooked, but they should not brown from outside. they should just get a crust from outside without any major color change. 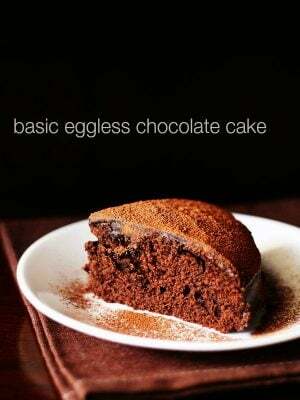 light browning of the edges is fine. remove with a slotted spoon. 15. place the half fried potatoes on paper kitchen towels. stack 3 to 4 paper towels. press some paper towels from top also to absorb extra oil. let the half fried potatoes cool down at room temperature. after removing this batch, you can fry the second batch of potatoes. by the time you fry the second batch of the potatoes, the first batch will cool down. so in the same oil, you can fry the first batch of half fried potatoes. 16. now increase the flame to a medium-high or high. the oil should be hot and have a temperature of 180 to 185 degrees celsius. 17. add the half fried potatoes to the hot oil. 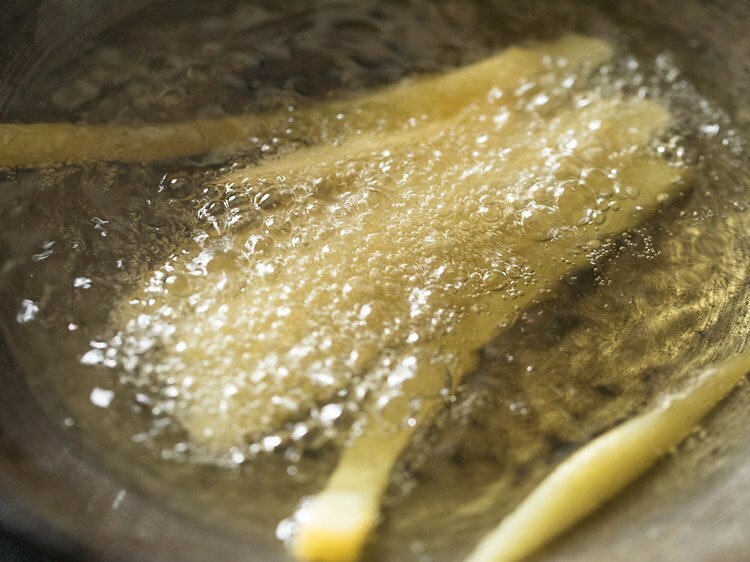 18. stirring often begin to fry the potatoes. 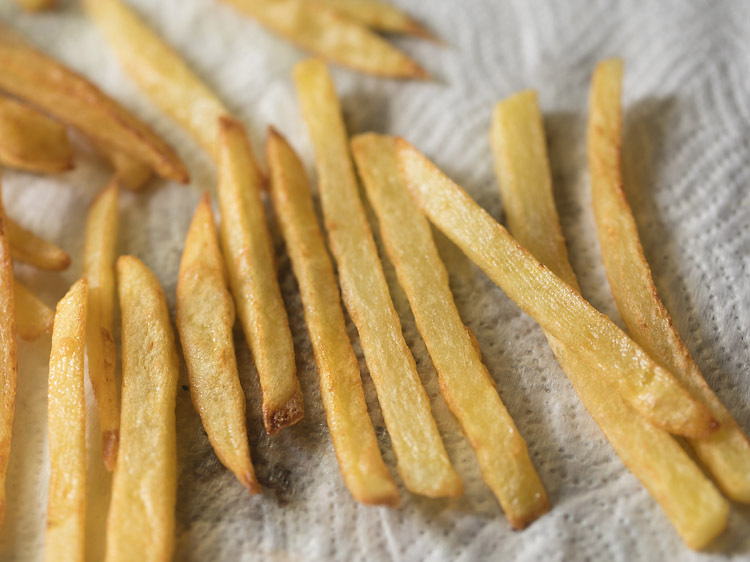 19. fry french fries till crisp and golden. 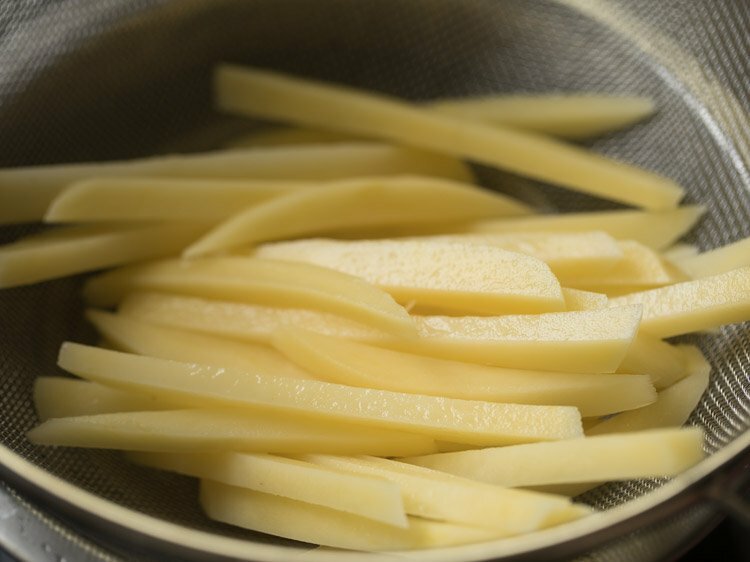 20. remove finger chips with a slotted spoon. 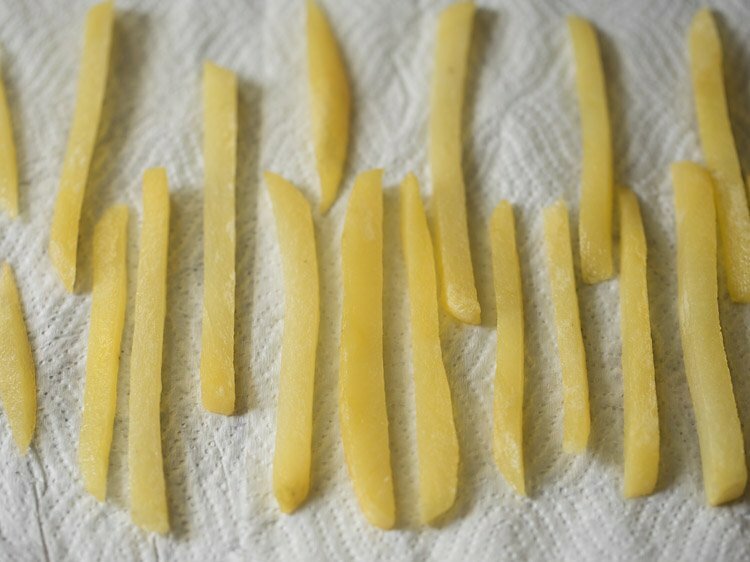 21. place french fries on paper tissues again to remove the extra oil. 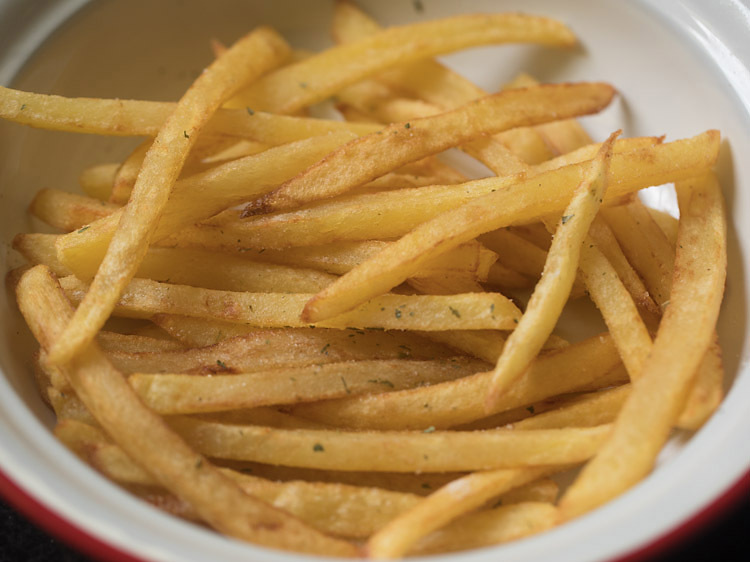 22. while still hot, take the french fries in a bowl. sprinkle with some salt, paprika or red chili flakes, dried herbs or dry rosemary. you can add your choice of herbs and spices. 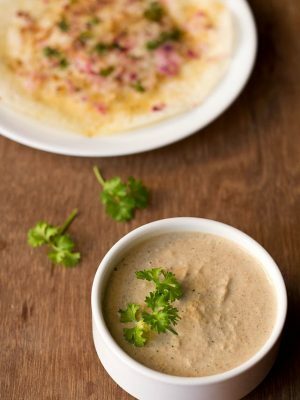 23. gently shake and toss the bowl so that the salt, herbs etc mix well with the finger chips. 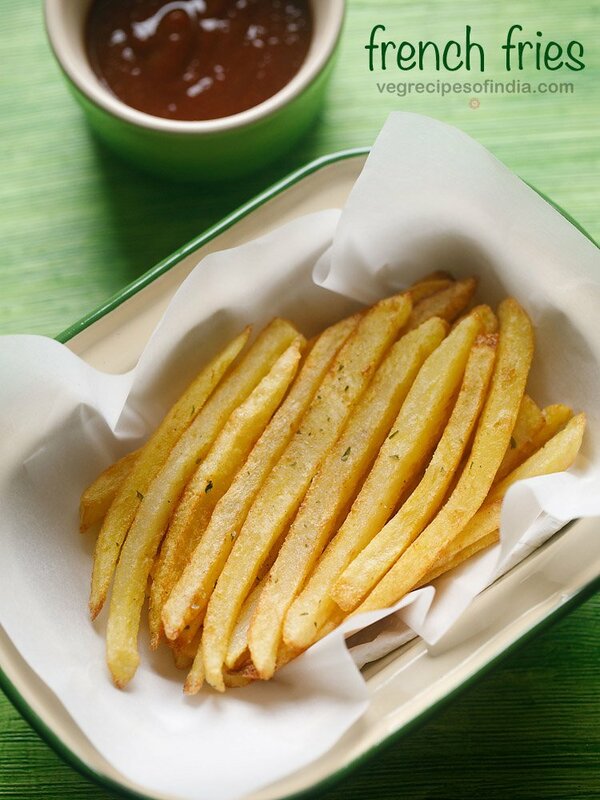 23. serve french fries hot with some any dip or sauce of your choice. here i have served these crispy finger chips with sriracha sauce. Hi Dassana,In this all the recipes are amazing specialy the French fries. thanks deepthi for your kind words. glad to know that you are liking the recipes. Can i keep potato in cold water & in fridge whole night . . & Then make fries in the morning? Can we first dip the potatoes in cornstarch batter before putting them into the oil? the corn starch batter will coat them and they will have a taste somewhat like the paneer fried during preparing chilli paneer. 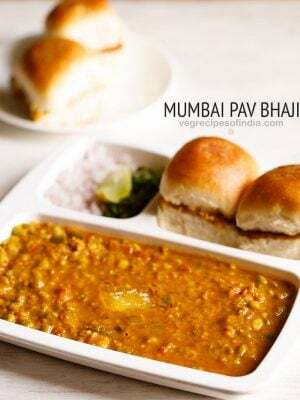 Can we make this in microwave ? i have never made french fries in microwave, so i do not know how good they turn out.